The Windows Sysinternals group at Microsoft has released Disk2vhd that is a free physical to virtual converter. Disk2vhd allows you to create VHD (virtual hard dive) files from physical drives on your computer while your system is online. The VHD files generated can be used in Microsoft Virtual PC or on Hyper-V server and you will have an instant clone of your machine running virtually. This is perfect for duplicating a production server for a development virtual machine that you can use on a different computer. Below is a Microsoft screenshot of a copy of Window Server 2008 R2 Hyper-V system running in a virtual machine on top of the system it was created from. To get started download the utility from Microsoft by clicking here. After you have it downloaded, extract the zip file and run disk2vhd.exe. Now just specify the VHD file name and location and check the drives you want to convert to a VHD. 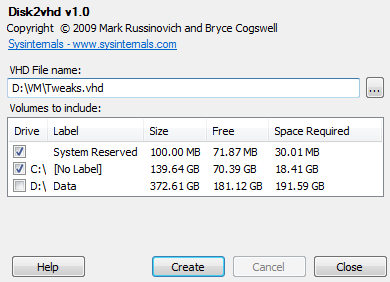 Each physical partition will be saved in a separate VHD file. Click Create and the process will begin. On my computer it took about 45 minutes to copy the drive into a VHD file because of a large amount of data. Once completed copy the VHD files to any computer with Microsoft Virtual PC, Hyper-V or any virtualization app that supports VHD files. Then just setup a new virtual machine to point to the existing VHD files.